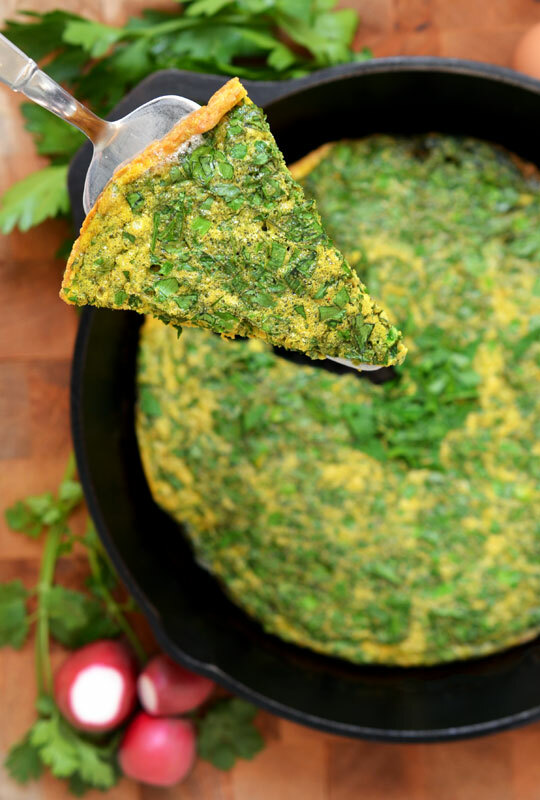 My favorite part about making kuku sabzi is running my knife through the big handfuls of fragrant herbs that give this Persian frittata its name (sabzi means herbs in Farsi). Fresh parsley, cilantro, chives, and dill are the stars of this recipe, though you can substitute leeks, scallions, tarragon, spinach, or other tender greens that you have on hand. 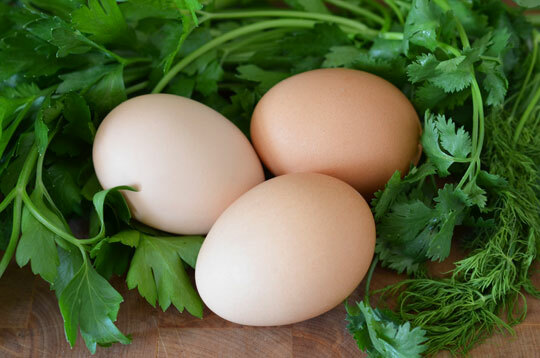 Whisk them into eggs, pour into a skillet, and in minutes you have a beautiful, nourishing dish that can be served as an appetizer, side, or main for any meal of the day. In Iran, kuku sabzi is traditionally served at Nowruz, the New Year, as it symbolizes rebirth (herbs) and fertility (eggs). 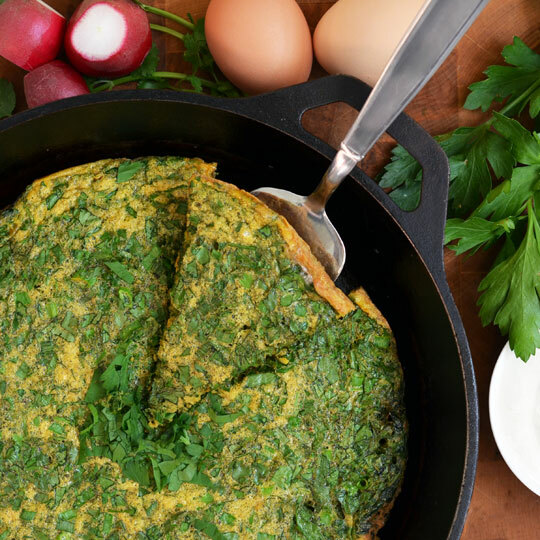 In addition to the herbs, this frittata or omelette often contains walnuts and barberries – little jewels that give it extra color, texture, and flavor – but these special ingredients aren’t essential if you’re just whipping this up for a quick breakfast, lunch, or snack. In fact, most of the ingredients and measurements here are pretty loose. 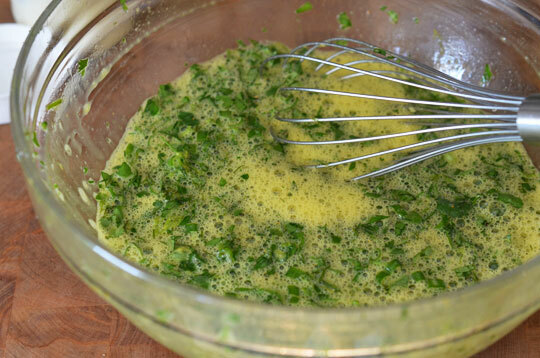 I recommend using a generous amount of at least three different herbs, but otherwise you can adjust the quantities and ratios depending on what you have on hand. This dish is also a fantastic way to use up extra parsley or cilantro that so often seems to be lurking in the refrigerator. Traditionally kuku sabzi is made on the stovetop, but some people bake it in the oven. My recipe is a hybrid, cooked like a frittata by starting it on the stove and finishing it in the oven. It can be served hot or cold, and is especially nice with a dollop of cool, tangy yogurt. Whisk together the eggs, garlic, flour, turmeric, salt, and a few cracks of black pepper. Whisk in the herbs, walnuts (if using), and dried fruit (if using). Heat the butter or oil in a 10-12" skillet over moderate heat. Pour the egg mixture into the skillet and use the back of a spoon to spread it out evenly. Cook until the eggs start to set around the edges of the skillet, about 2 minutes. Place the skillet in the oven and bake until the eggs are completely set, about 5 minutes. To test, cut a small slit in the center. Serve hot or cold, cut into wedges. Especially delicious with a dollop of yogurt.